We are proposing to change City code. Currently many of our floodplain regulations are based on the 100-year flood. We are proposing an interim 100-year floodplain for our regulations until floodplain maps can be redrawn. This interim floodplain is based on the current 500-year floodplain. This change means that the current floodplain regulations will apply to more properties. Property owners and businesses in the interim 100-year floodplain would have new restrictions if they want to develop, expand, remodel or improve their properties. Find out more about the proposed changes or download the draft ordinance. Click the "I want to" button, then "Explore Atlas 14 Changes"
Enter your address and click on "Search." Areas shown in blue are mapped within the 100-year floodplain currently. Purple areas indicate the interim 100-year floodplain, based on Atlas 14 and our new understanding of flood risk in Austin. To print or download a map of your property, click the "I want to" button again and select "Print a Floodplain Map." Check the circle next to "Custom Map" and then the circle next to "Atlas 14." Choosing "Print Current" will prepare a map of the area you are currently zoomed in to. Learn more. Find out more about Atlas 14 and its impacts. Contact your insurance agent about flood insurance. Make a flood safety plan. Participate in a public hearing about proposed code changes. 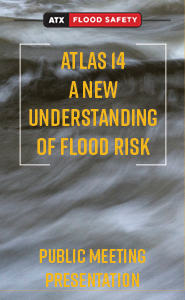 Sign up for Atlas 14 email updates by sending us an email and requesting to be added to our Atlas 14 distribution list.